Tempting as the supposition is, Albert George does not appear to belong to the same branch of the Ansell family as the Albert Ansell on the Ranmore War Memorial who died in World War 1. The surname Ansell has a fairly large distribution in Surrey and, trawling back through the records for five generations, there is no sign of a link. Around 1800, Albert George’s ancestors are in Capel, those of the earlier Albert in Effingham (villages on either side of Dorking, eight or so miles apart). There may be a family connection further back, but not yet discovered. Albert’s father George Ansell was born in Marylebone, London in 1870. In the 1881 census he is living in the household of his grandfather Richard Ansell in “Ranmore Wood Cottage”: judging by its position relative to adjacent dwellings in that census, this is probably the house now called “Ashcombe Cottage”. Richard Ansell had been born in Capel about 1826. By the 1861 census he was married to Jane nee Worsfold and living on Ranmore. 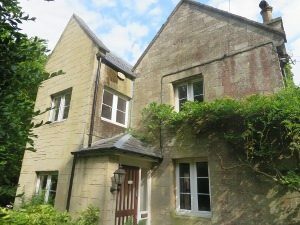 Richard and Jane had numerous children, and by 1881 the family had moved to Ashcombe Cottage and Richard was a woodman on the Denbies Estate. By 1891 he had been promoted to Estate foreman. 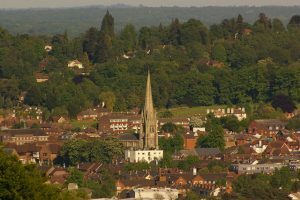 On 28th May 1893 at St Martin’s Dorking, George Ansell, woodman, married Elizabeth Martha Simmonds, the 22-year-old daughter of Thomas Simmonds, stone sawyer. Allen Baker was one of the witnesses. 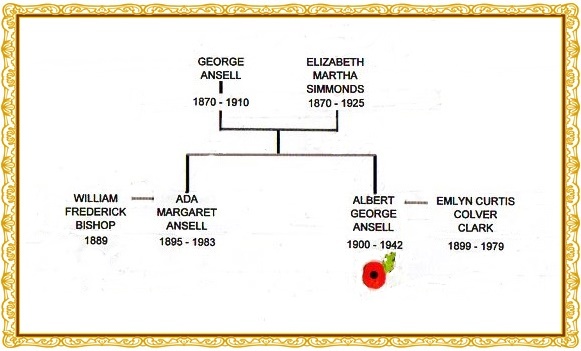 By the time George and Elizabeth’s first child Ada Margaret Ansell was baptised at St Barnabas on 7th July 1895, the family were living in 10 Chalk Pit Cottages, Dorking, and George was now a carpenter. 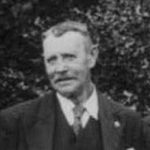 However, he had reverted to being a woodman by the time his son Albert George was born in 1900; the family were living on Ranmore, probably in Ashcombe Cottage, where they were a year later in the 1901 census. George became the Estate foreman, like his grandfather Richard. possibly when Richard retired to live with Jane in Chalk Pit Cottages. George died in 1910 as a result of a dramatic accident aged 40. The circumstances and subsequent inquest are graphically described in the “Dorking and Leatherhead Advertiser” editions of 8th and 13th January. On the afternoon of Monday 3rd January George left home, telling his wife he intended to shoot a pigeon or two. Subsequently a shot was heard, but he failed to return home. The worried Elizabeth alerted neighbours and the following morning the Lord Lieutenant (the Hon. Henry Cubitt) organised the Estate workers in a systematic search. About midday on the Tuesday Charles Gale, the Estate wheelwright from Lonesome Cottage, found George lying unconscious on the ground in the Dorking Wood on the Polesden Estate. His gun was leaning again a beech tree upon which boot nail marks were discovered, the supposition being he had climbed 16 feet up the tree and a decayed branch given way under his weight. There was a dead pigeon in his pocket, seemingly why he had climbed the tree as these were often used as decoy birds, Dr Proctor of Great Bookham was summoned from attending patients at the Ranmore Dispensary and, subsequently, Police Superintendent Boon accompanied gamekeeper Henry Hedger to view the scene. The base of George’s skull was fractured and, although he was carried home, he never regained consciousness and died at 11 pm. An inquest was held the following Friday (7th January) at the Fort. The coroner Mr G F Roumieu interrogated various witnesses, including the widow Elizabeth Ansell, Charles Gale the wheelwright who found George, Dr Proctor’s partner Dr Fisher, and Superintendent Boon. Various questions were raised as to whether George’s skull had been fractured by a blow to the head, by the falling branch or by his own fall, and whether the fact that he was found some distance from the tree indicated that he had partially regained consciousness and struggled along a few feet. Finally, the coroner directed the jury, of whom the Denbies butler Charles Boxall was foreman, to return a verdict of “Accidental Death”, with deepest sympathy to the widow. George Ansell’s grave is in the top right hand corner of the photograph. The double grave in front is that of his grandparents Richard and Jane Ansell. George’s funeral took place on Saturday 8th January; all Estate work was suspended so that employees might attend. The coffin was borne on the shoulders of the Estate workers the few hundred yards from George’s home Ashcombe Cottage to St Barnabas. The service was conducted by the Rector, the Rev. C S H Sandwith, the Hon. Henry Cubitt being in attendance. George was buried in the churchyard (B6) among a cluster of other Ansell graves, which now include the memorial to his grandparents Richard and Jane, who both died five years later in 1915. Albert’s mother was a local girl, born in Dorking and baptised at St Martin’s on 4th December 1870. Her parents were Thomas and Martha Simmonds, Thomas (stone sawyer) from Dorking, Martha coming from Farnham. The couple have an older child Alfred John Simmonds, aged 5, born in Dorking. A year later in 1871 we find the family in Mill Lane, Dorking, off London Road and adjacent to Pippbrook Mill and the “Evening Star” pub. Ten years later in 1881 the family, still with only the two children, are living in Vincent Walk, Dorking, and Thomas the father is now described as a builder’s labourer. By 1891 the 21-year-old Elizabeth Martha is working as a general servant in a bootmaker’s household at No 99 High Street, Epsom, Surrey. She married George Ansell at St Martin’s Dorking two years later. According to the electoral registers the Hones continued to live on Ranmore, at Yew Tree Cottage or perhaps Lime Tree Cottage next door. In 1925 when Elizabeth Martha was very ill, Lord Ashcombe was asked to use his influence to get Albert home from India on leave to see her before she died. Walter William is probably the W.Hone (right) in the 1934 Harvest Lunch photograph of men with 20 years’ service on Denbies Estate. He survived Elizabeth by 10 years, dying in 1935. Albert George Ansell had only one sibling, his sister Ada Margaret. She was born 16th May 1895 and baptised at St Martin’s on 7th July when the family were living at 10 Chalk Pit Cottages, Dorking. On 28th August 1899 Ada started at the Infant School at Dorking, but left soon after when the Ansells moved to Ranmore. There she attended St Barnabas School from 30th April 1900 until in 1909 the logbook says, “Ada Ansell’s name was removed from the registers because she is now fourteen and has left school”. Probably she went to the Dispensary to be trained for domestic service; certainly, in the 1911 census, the year after her father’s accidental death, aged fifteen she is a servant in the Knightsbridge house of the elderly widower George, 1st Lord Ashcombe. On 7th August 1922 the 27-year-old Ada married William Frederick Bishop in St Barnabas. He was a 33-year-old sailor, residence Portsmouth: one cannot help surmising that the couple met through Ada’s brother Albert with his naval connections. William Frederick’s father George was a brushmaker; Ada’s father George Ansell, although long dead, was described as [?Commons] keeper (marriage register difficult to read). It is not clear if Ada and William Frederick Bishop had children. 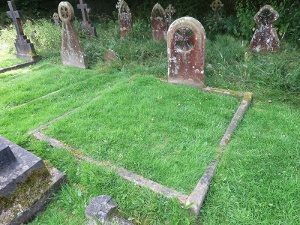 In 1942 she was named as one of Albert George’s executors; otherwise it is not certain what happened to her or to William Frederick before she died about 1983. Albert George fits in here in the family order. Born 10th March 1900 on Ranmore Common and baptised at St Barnabas, he was killed during World War 2 on 15th November 1942. See his page for more details of his life and death. The eldest son was born 18th August 1929 at Haxton, Netheravon. Reginald (Regie) emigrated to South Africa when he was about 20 where he married a South African girl. He died recently. John William Ansell was born 15th March 1931 at Dunfermline, Scotland. He married Janet Watton in 1971, At the age of 54, for fun he sampled a course at the Brands Hatch racing school, which inspired him to take up competitive motorcycle racing. He did extraordinarily well against much younger riders on much more up-to-date machines than his 125 cc Yamaha. From 1985 to 1999 he was placed in many 125 cc Championships, winning the Kent Racing Combine Championship in 1989, the British Motor Cycle Racing Club Matchless Cup and also the Rochester Trophy in 1990, and the BMC Racing 125GP Championship in 1994 aged 63. Such triumphs did not come without spills, most notably in 1991 when he crashed at Brands Hatch, breaking his pelvis, and in 1992 at Mallory Park when he broke his shoulder, His enthusiasm was supported by his wife Janet who mixed fuel and changed wheels for different race conditions. John died in 2013. Albert George Ansell’s only daughter was born on 30th October 1941 at High Wycombe and named after her mother and her mother’s sister. Her father mentions her with special affection in his last letter home just after her first birthday. She married and has children. George was born at High Wycombe on 19th March 1943, four months after his father’s death. He emigrated to Australia.